The PXC Compact Series Unitary Equipment Controller (Programmable Controller–Compact) for BACnet networks is a high-performance Direct Digital Control (DDC) equipment controller, which is an integral part of the APOGEE Automation System. 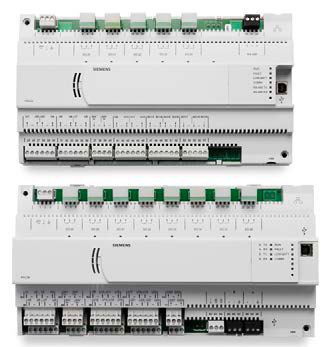 The controllers are classified as a BACnet Advanced Application Controller (B-AAC) with support for BACnet MS/TP protocol. The PXC Compact UEC Series offers integrated I/O based on state-of-the-art TX-I/OTM Technology, which provides superior flexibility of point and signal types, and makes it an optimal solution for Air Handling Unit (AHU) control. The PXC Modular (Programmable Controller - Modular) is an integral part of the APOGEE® Automation System. It is a high performance, modular Direct Digital Control (DDC) supervisory field panel. The field panel operates stand-alone or networked to perform complex control, monitoring, and energy management functions without relying on a higher level processor. 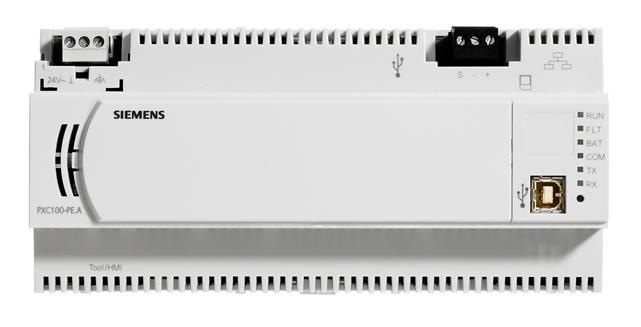 TX-I/O Modules are modular expansion I/O consisting of an electronics module and terminal base. The electronics modules perform A/D or D/A conversion, signal processing, and point monitoring and command output through communication with the PXC Modular. The terminal bases provide for termination of field wiring and connection of a self-forming bus. The PXC Modular Expansion Module provides the hardware connection for Field Level Network (FLN) devices. Using the Triple RS-485 Expansion Module, the PXC Modular supports up to three RS-485 networks of Field Level Network devices. The PXC Modular is a high performance controller with extensive flexibility to customize each field panel with the exact hardware and program for the application. As a result, the user only purchases what is needed. For example, in monitoring applications, the control panel can be customized with the number and type of points to match the sensor devices. For monitoring and controlling a large number of (on-off) fans or motors, more digital points can be added.